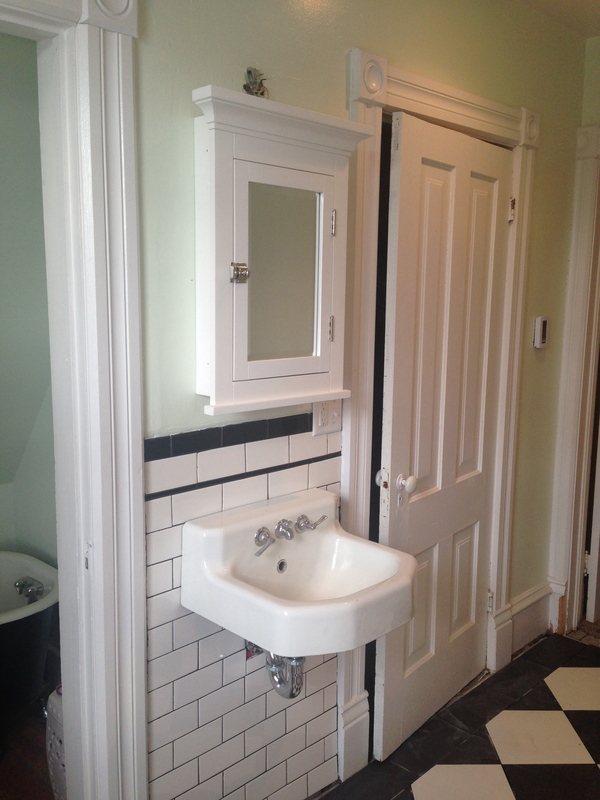 We started the New Year with a little bathroom rennovation project. It’s actually been finished for a couple months… except for an odd sized outlet cover, that just got cut and painted yesterday. The devil is in the details, you know. The shower is next. Lance did all of the tile work himself. 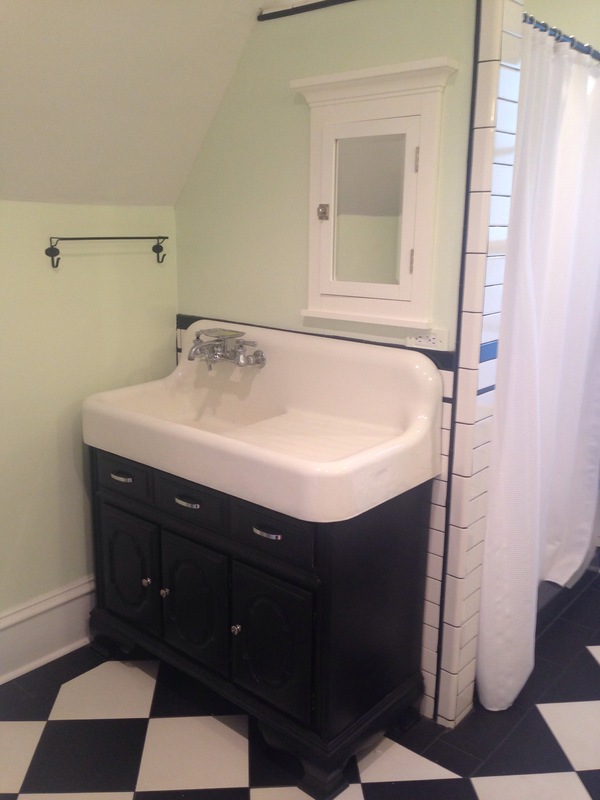 The shower base (48″ square) was a splurge, but was tile-ready, looks great and will wear well. 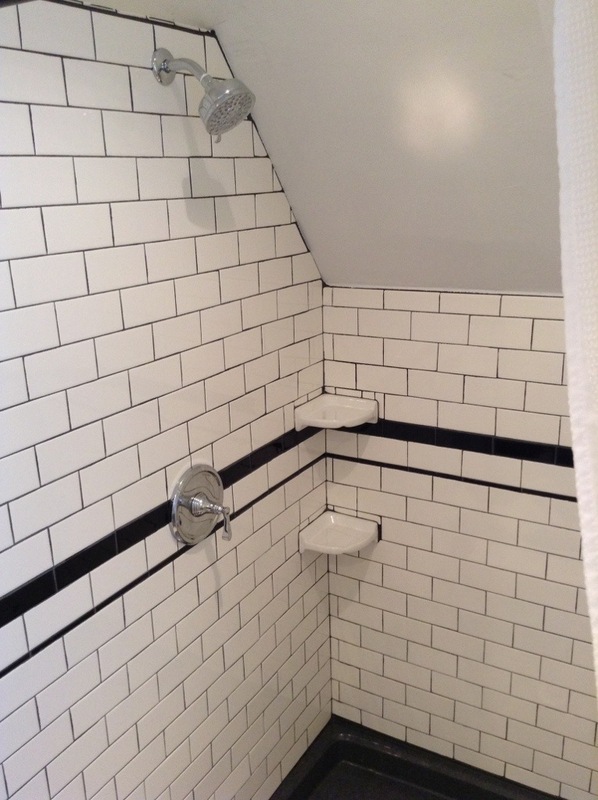 The shower rod is a piece of pipe painted black that also serves to stabilized the wall we put up. Shower close-up. 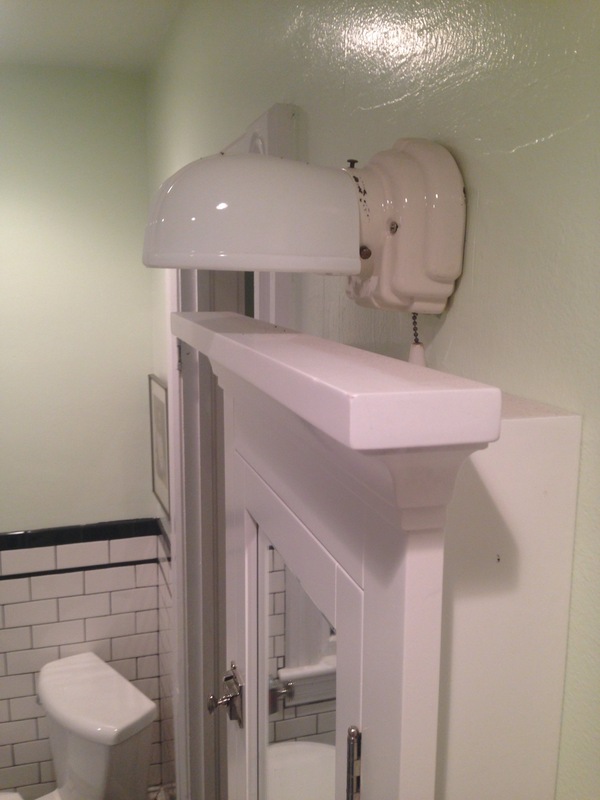 We went with a simple, classic looking, affordable fixture. Who knew how outrageously expensive they can be?? 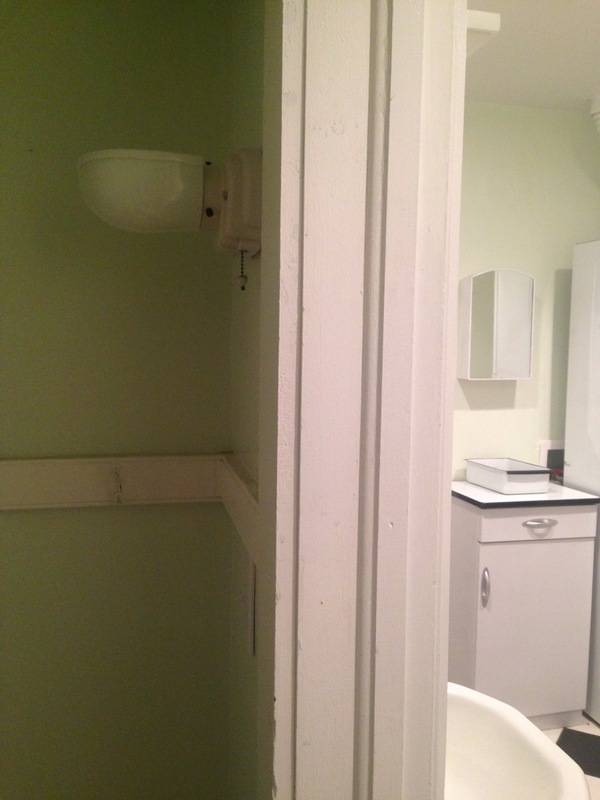 Next on the tour is my faviorite thing… the tub closet. 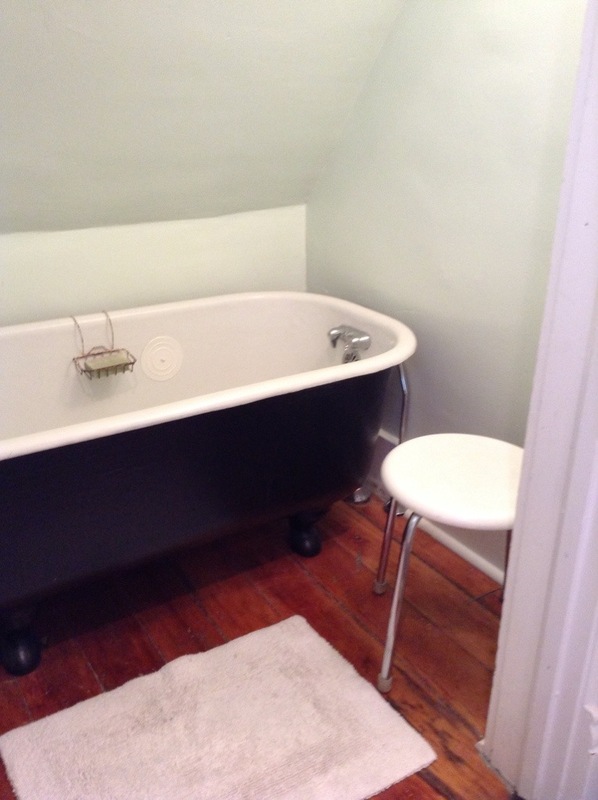 This was the biggest challenge for us- what to do with the original clawfoot tub. 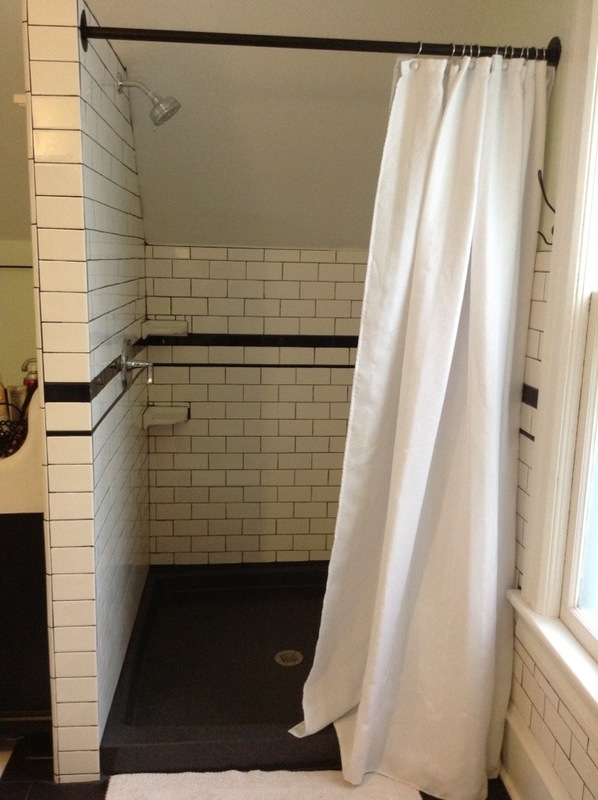 My 6’3″ husband did not want to live with a free-standing tub surrounded by a shower curtain, and I did not blame him. 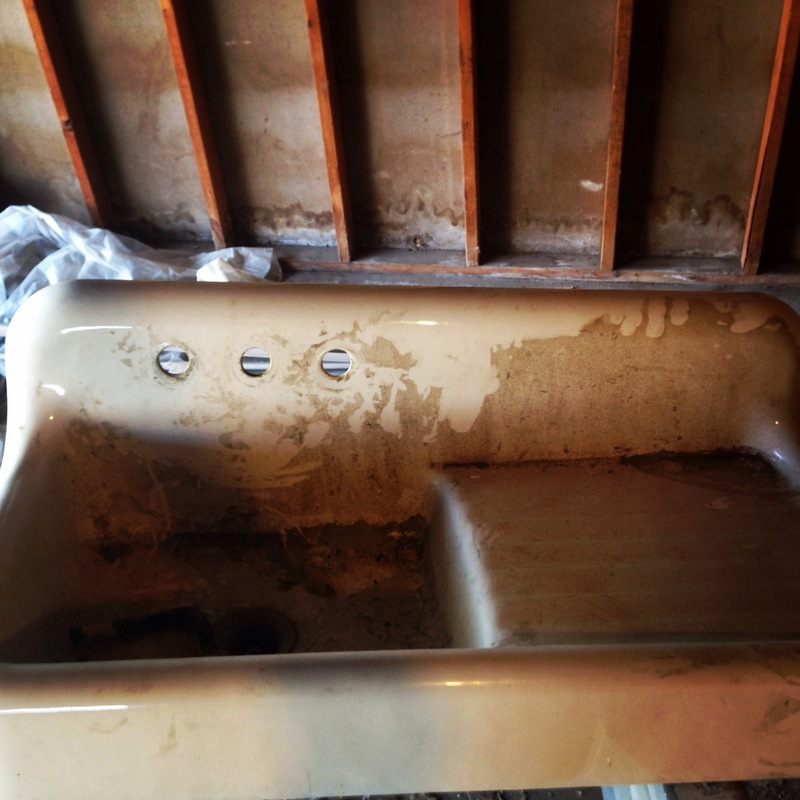 But… BUT… what kind of person would I be if I got rid of the original clawfoot tub??? I just couldn’t do it. After much huffing, pacing, gnashing of teeth, etc, it dawned on us (Lance): put the tub in the closet. It actually fit and the plumbing from toilet and sink was so nearby that tieing in plumbing for the tub was no big deal! The floors were painted grey (and had been possibly orignially so). We refinished them and I love the little touch of warmth it adds. The vintage stool was a $3 swap find and the antique soap holder was another $3 from the antique store down the street. Also from the antique store at the end of my street… antique lighting. I found two of them, I think for $10- $15 each. Love the little buggers. The little bookshelf my grandpa made in 8th grade shop class (late 30s or early 40s) fits nicely in the tub closet and holds odds and ends. Up next is our second sink (having two is convienient when 3 females and 2 males share 1 bathroom). We found it on Craigslist for about $50, I think. Fixtures included. 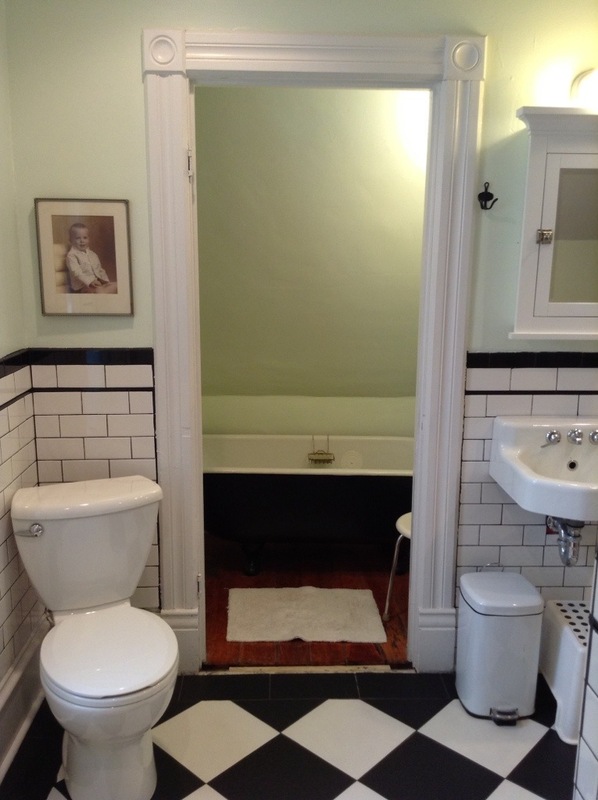 This shot was taken a long time ago, but is the only one that shows the sink in relation to the medicine cabinet. 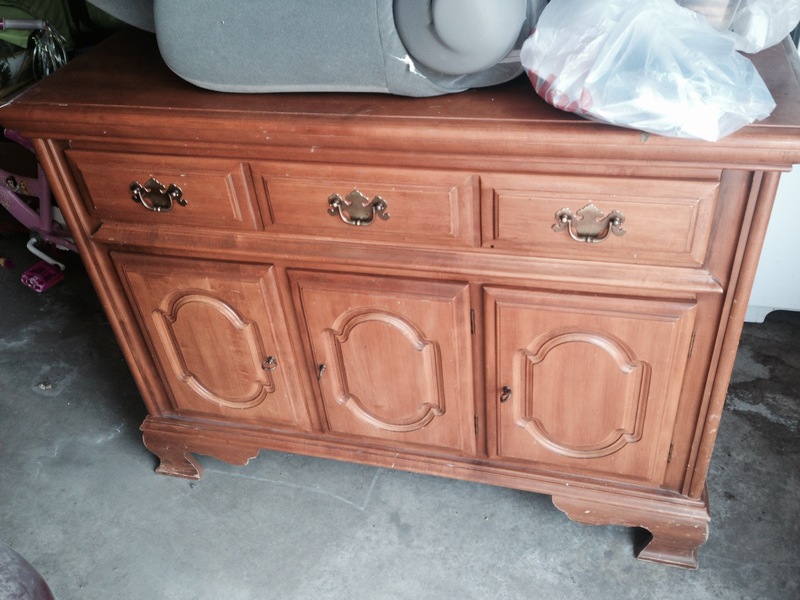 I found two of these Restoration Hardware cabinets on Craiglist (new, in box) and paid $70 each. Isn’t she beautiful? 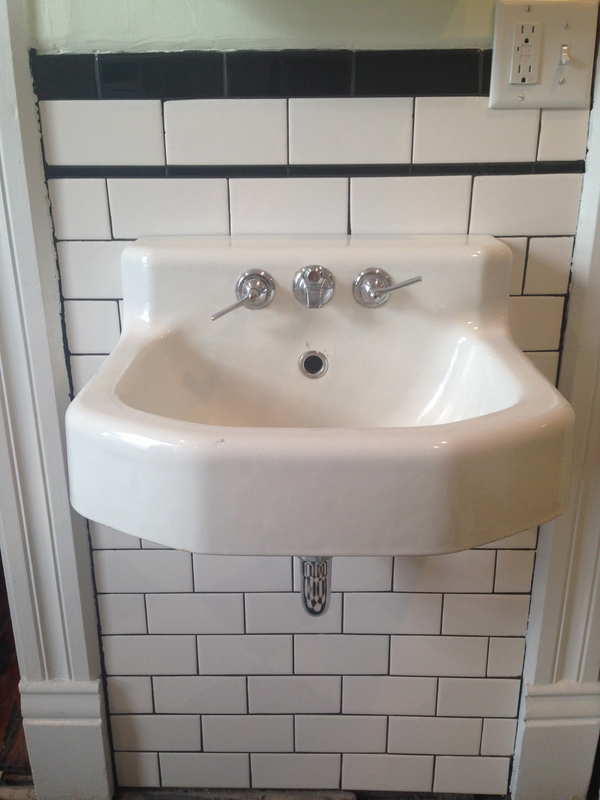 Why would some one ever, ever, ever buy a new sink for hundreds of dollars, when such perfection is available for so little? The other light from the antique store. Not sure if it is exactly right for the spot, but I don’t really care. Last stop on the bathroom tour isn’t the most beautiful spot, but it is a very important one. We moved the laundry room upstairs. This will allow us to convert the old main-level laundry room to a proper powder room this winter. I cannot wait for this project! 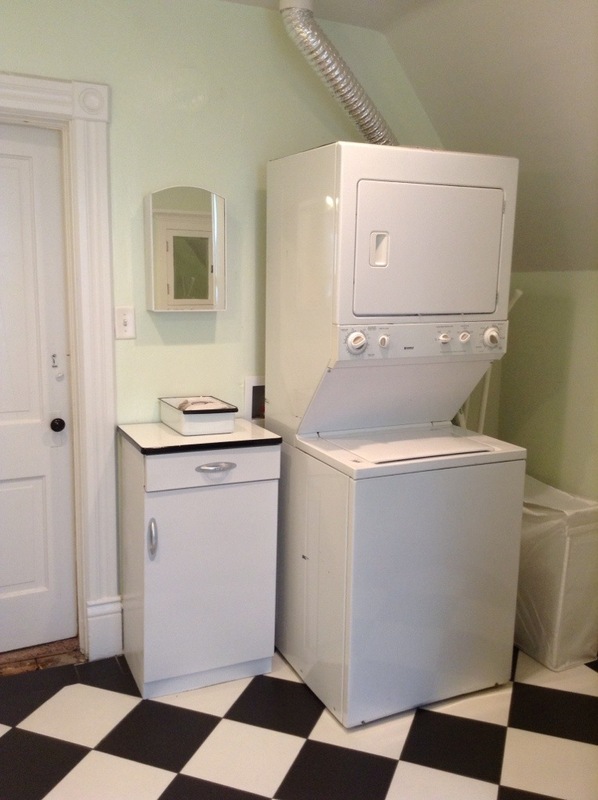 The washer /dryer is a no-frills Craigslist find and just what I wanted. 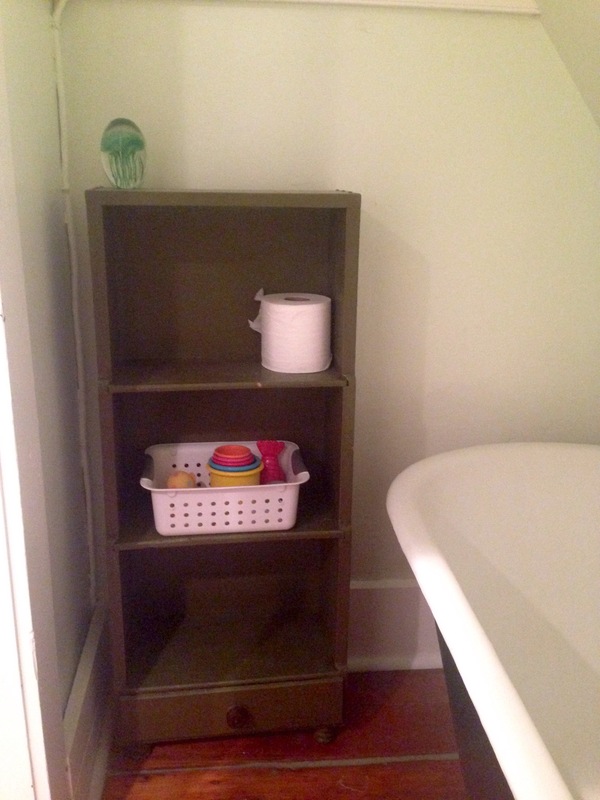 The cabinet is a $17 thrift store purchase and the medicine cabinet above came out of my grandparent’s basement. 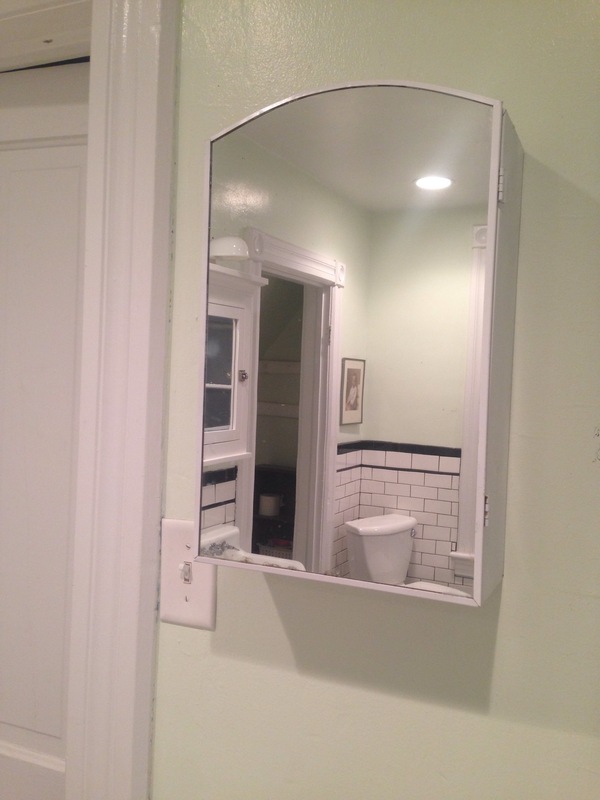 My grandpa (same one who built the bookshelf) always showered down there and shaved in this mirror. -Another splurge was updating the lighting. I will not put can lights in any other room of this house, but in the bathroom, it really made such a nice difference. -Paint color is “Cabbage” by Valspar. I love it. Final Thoughts: This was quite a project. 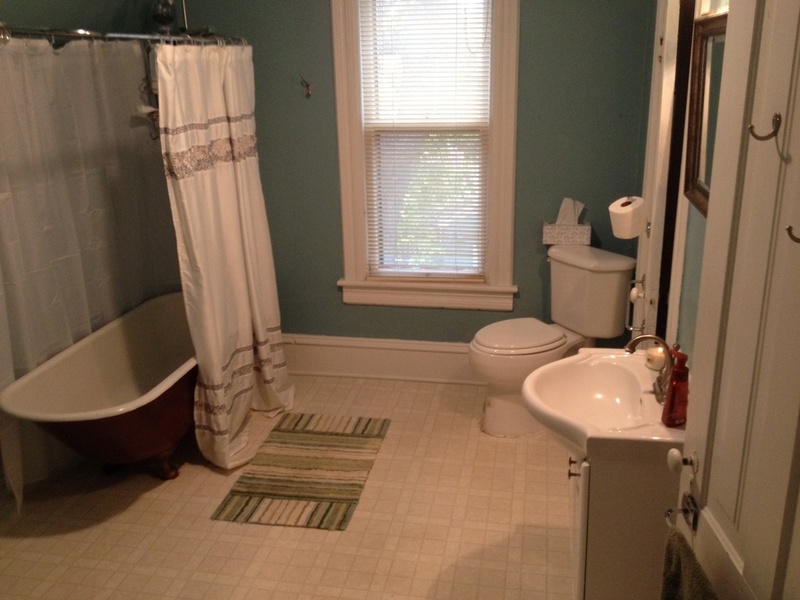 Our first complete bathroom renovation, I’d say, was a complete success. The space is 100% usuable and not wasted, like before. It is bright and cheery. 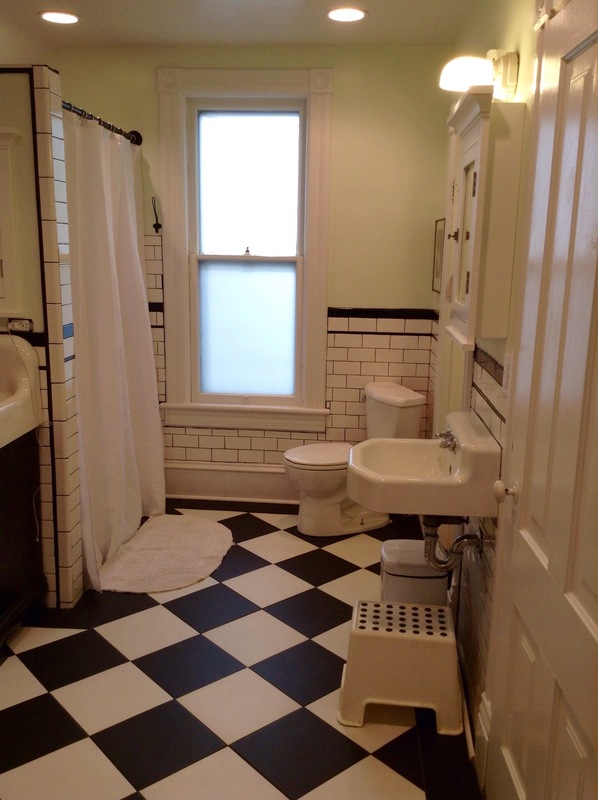 I think I pulled off a vintage look that hopefully will be timeless, helping us to avoid another remodel. New materials: wall tile, floor tile, shower, lighting, towel hooks and rods. 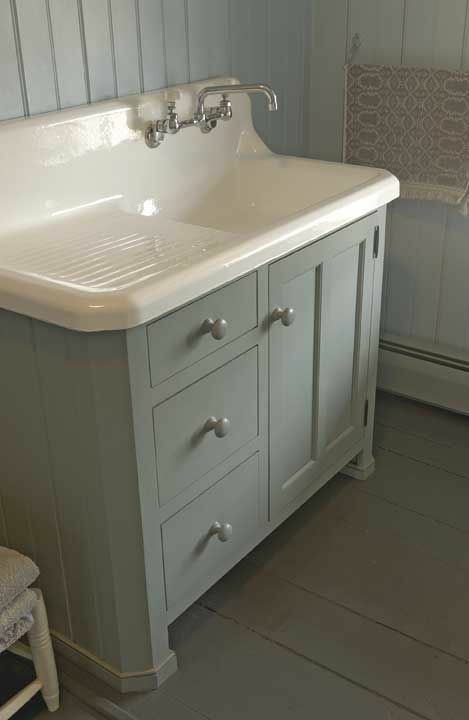 Old materials: sinks, tub, sink cabinets, storage cabinets, medicine cabinets, lighting, accessories and decor. Thanks for follwing my bathroom saga.. for us, it was worth the wait. WOW! 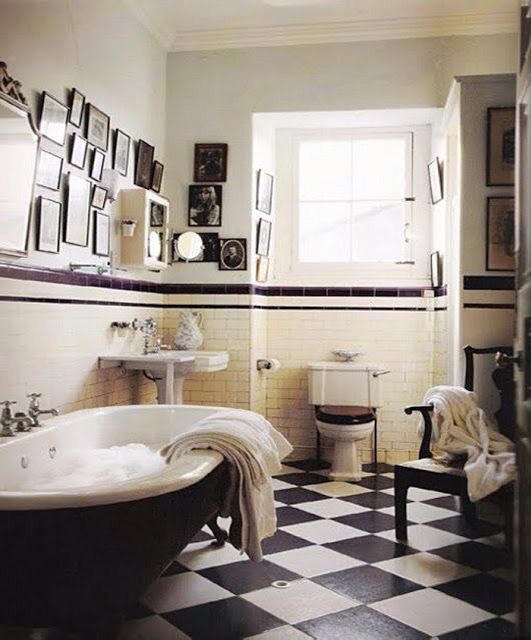 You did a wonderful job on this bathroom. You are an inspiration to many who follow your blog. Great job! !